There is a new year-long exhibition at the Canadian Museum of Nature that is a perfect marriage of science and art. The show is called Beneath the Surface: X-rays of Arctic Fish. First of all, museum personnel arranged fish specimens in such a manner that they looked alive and ready to swim away. Then x-rays were taken and the resulting images on a black background were enlarged and placed into back-lit light boxes. Sixteen of these images can be found in the museum’s basement Stone Wall Gallery. The results are spectacular from both an aesthetic and scientific point of view. The images are ghostly and totally mesmerizing works of art. They are also, to scientists, very revealing in that they clearly show the bone structure of the x-rayed fish and such other important details as the fishes’ stomach contents. Knowing who eats what in the Arctic Ocean is a valuable tool to understand the entire eco-system. 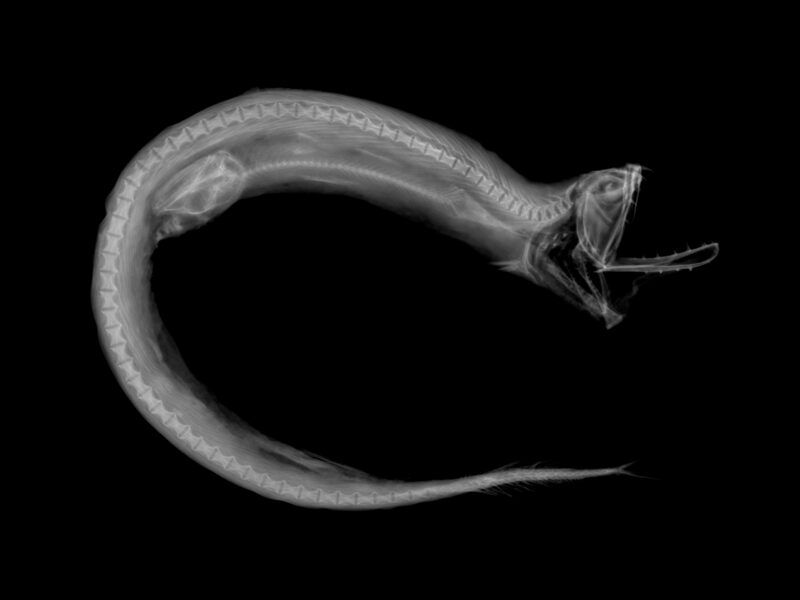 Check out the little fish inside this boa dragonfish. Photo by Noel Alfonso/Roger Bull, Canadian Museum of Nature. One image is of a fierce boa dragonfish, its huge mouth wide open. The dragonfish has just swallowed whole and headfirst some other smaller fish, whose skeleton is clearly visible inside the larger fish. And there is a shot of a Greenland halibut chasing some much smaller glacier lanternfish. Us humans, of course, chase the halibut, the Greenland variety being a particular delicacy. This is an exhibition that should wow the kids and interest the science-minded members of the family.